Royal blue color in combination of white forms the background of many brand symbols due to its . This is why we process large orders for promotional royal & white 64” arc vented golf umbrellas in all seasons. Technology marketers, construction houses, marine engineers - are some of our regular clients , who order custom royal & white 64” arc vented golf umbrellas for business gifting. 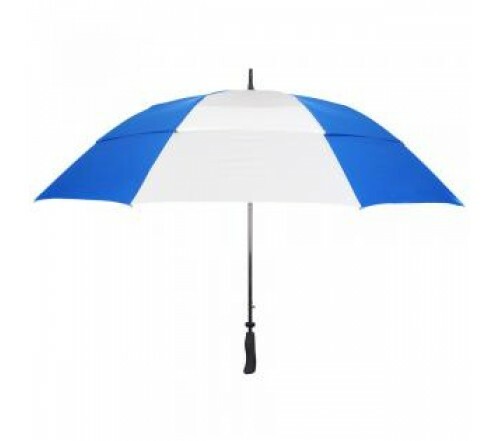 This auto open golf umbrella possesses a longer shelf life than regular umbrella because it is equipped with specialized features such as nylon canopy, windefyer vented canopy, and sturdy fiberglass frame. 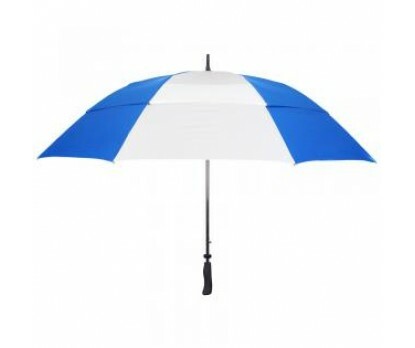 Personalized royal and white 64” arc vented golf umbrellas can be favored by all marketers who have high expectations from their investments because it is going to promote their welfare for a long time, when most others might have bowed out of scene. Imprint area - 10"W x 5"H. Dimensions - 64" arc - Closes to 42". Product & Design Quality - Very happy with the product. Customer Service & Shipping - Very happy with the experience.